1. 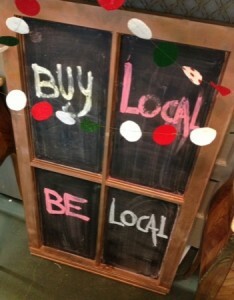 Approximately $73 out of every $100 you spend stays local! If you love your community, why not help give back to it? Local retailers also often support their local charities, schools, and communities in much higher capacities. 2. You get to avoid the mall crowds and congestion. This helps you save tons of time circling crowded parking lots, parking half a mile from your destination, and standing in long checkout lines. Most importantly, this helps save your sanity… because the holidays can be stressful enough already! 3. Your gifts will be unique and more meaningful coming from local shops. So much of what you buy locally has a story behind it, and you often get to find out about the actual person behind the craft or product. Photograph by K Lynn Photography. 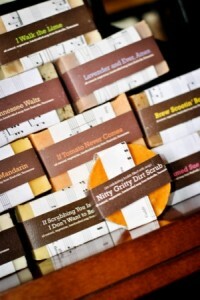 Soaps by Music City Suds, sold in 8th & Argyle and Art & Invention. 4. You get to meet your neighbors! The small, mom and pop stores and boutiques are usually run by extremely friendly and hard working business owners, who can be fascinating to talk to. Some have grown up in their communities and are helping change the face of their neighborhoods by creating thriving businesses. 5. It helps save the environment. Because a high amount of their goods does not have to be shipped, this helps reduce our global footprint. Many local stores also value recycling and products produced with protecting their environment in mind. An excellent source for learning about locally owned establishments in your neighborhood is Yelp!